Yoco is voted as being the most popular credit card machine for SMBs in South Africa. Allowing you to accept Debit and Credit Card Payments with no monthly fees or lock-in contracts. SalonBridge and Yoco have worked to bring our technologies together to provide you and your customers with a seamless experience. When capturing a payment from the SalonBridge console or Smartphone App, Yoco becomes available as a payment option. Transaction details are sent automatically to the secure card reader and the transaction result is sent back to SalonBridge instantly. The client payment is captured, account closed and published in your cash-up reports all within a matter of seconds. 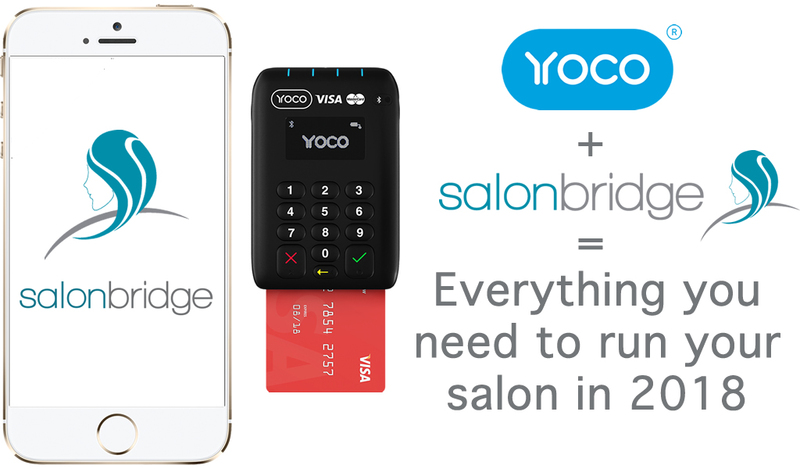 Sign up with SalonBridge and Yoco using the promo code ‘YoSalon’ and get R399 off your card reader!